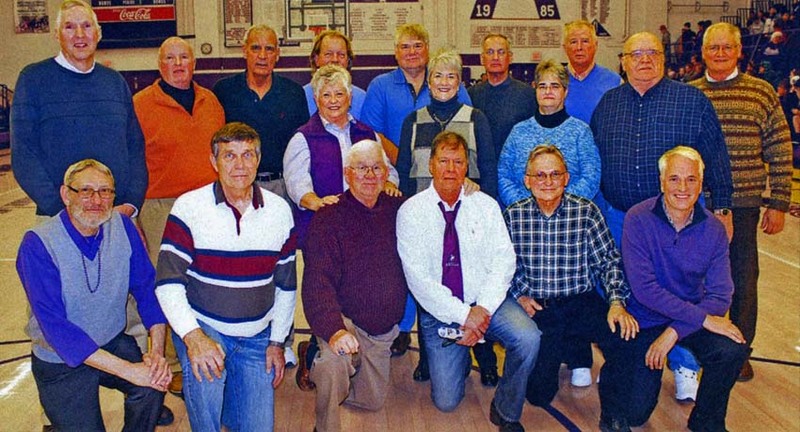 One of the more storied periods of Arcola High School basketball was celebrated on January 24, 2014. Players, coaches, cheerleaders and team managers from the 1962-63 and 1963-64 teams were recognized 50 years after their achievements on the court earned them a combined 51-8 record and several tournament and conference championships. 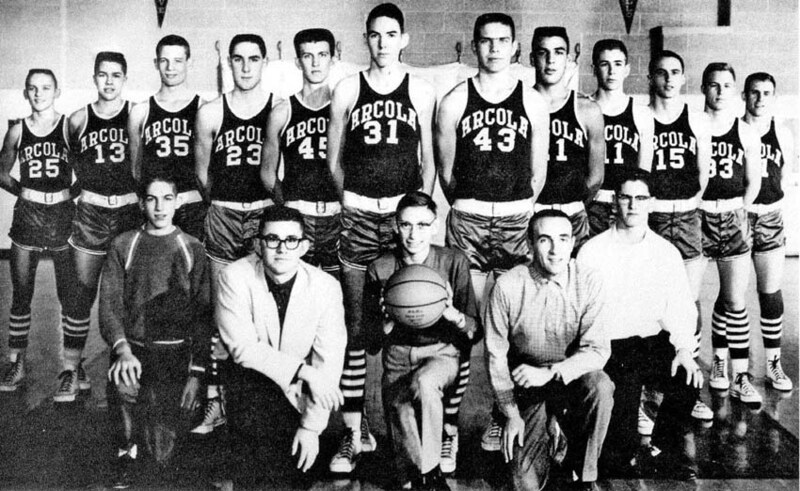 The 1962-63 team lost its first game of the season and won the next 26 before dropping its season finale to Mattoon in the Arcola Regional championship game. In the process, the 1963 squad won the Charleston Holiday and Okaw Tournament championships, as well as the regular season conference title. Its .929 winning percentage is the best in the history of boys’ basketball at Arcola. Leading scorers on that team were Jim Monahan, Terry Miller, Randy Rothrock, Sam Walton, Duan Bartholomew and Doug Dunagan. 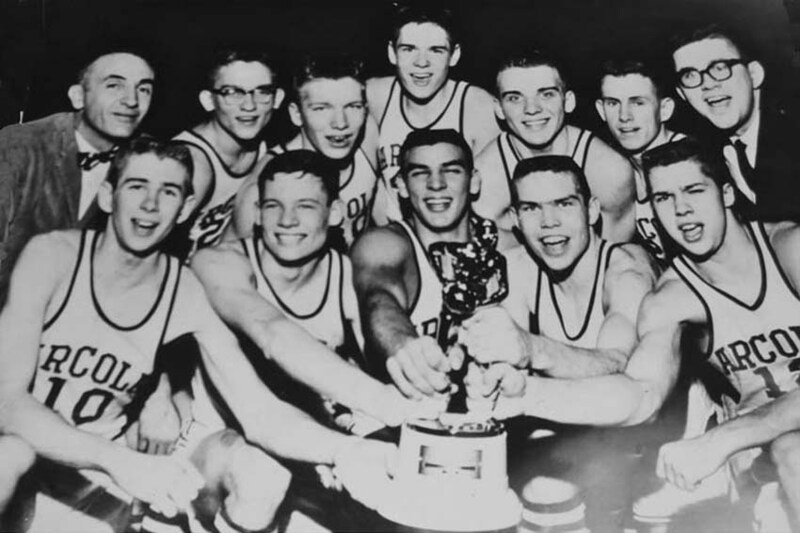 In 1963-64, a team led in scoring by Miller, Rothrock, Dunagan, Walton and Reggie Finn logged a 25-6 record and became only the second Arcola boys’ team in history to advance to the “Sweet 16” of the state tournament when it beat Champaign High School for the sectional title. The Purple Riders accomplished this feat during a period in Illinois prep basketball in which all teams, regardless of enrollment, competed in a one-class system. 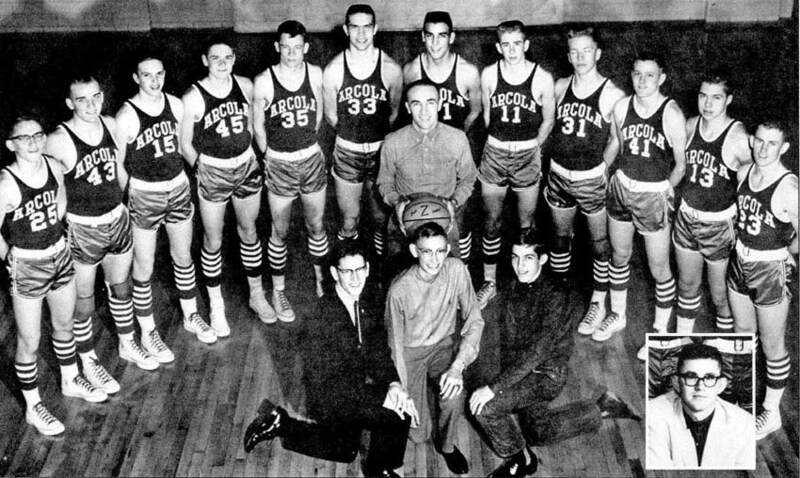 The 1964 squad is the last Arcola team to advance as far as the Sweet 16. During that season, the Purple Riders were champions of the Charleston Holiday Tournament, Okaw Conference Tournament, Mattoon Regional Tournament and Champaign Sectional Tournament. Arcola also earned the Okaw regular season title. This three-season stretch in Arcola boys’ basketball history produced three of the players who scored more than 1,000 career points. There are 11 boys’ players in school history who have topped 1,000. Miller is tied for eighth on the career scoring list with 1,122 points, while Monahan (1,121) is 10th and Dunagan (1,047) is 11th. Rothrock, a key player on both teams, introduced those who were in attendance, including Mike Blaase and Terry Knaus, Class of 1966; Ron Gardner, Bill Blackwell, Dunagan, Jerry Glenn and Joella Strader Glenn, Class of 1965; Finn, Walton, Miller, Robert Michael Doyle and Phyllis Green Turner, Class of 1964; and Monahan, Bill Anderson and Billiejean Arthur Clark, Class of 1963. Doyle was the team’s manager/statistician, while Joella Strader Glenn, Phyllis Green Turner and Billiejean Arthur Clark were cheerleaders. Assistant coach Byron Bradford was also in attendance. Bradford, an AHS graduate, taught and coached in the Arcola school system for 49 years. A member of the Illinois Football Coaches Hall of Fame, Bradford was a member of Steve Thomas’ football coaching staff during a time when Purple Rider football won three Class 1A state titles in 1978, 1985 and 1988. Mark Avery represented his father, Bob Avery, who was the head coach for five years from the 1959-60 through the 1963-64 seasons. Bob Avery had planned to attend, according to Rothrock, but inclement weather near where he resides in Texas prevented him from making the trip. Blaase and Knaus were key players on the 1965-66 team that won 17 games and defeated Mattoon for the regional championship. The regional title by the 1966 team set off a four-season span in which Arcola teams won a combined 85 of 110 games. The regional champion 1968 team won 25 of 29 games, and its .862 winning percentage is the third best in school history. Video of the event was recorded by Rachael Crane. Click to view the program. Pictured below are those who were able to attend the January 24, 2014 ceremony. Front row (L-R): Robert Michael Doyle, Dr. Sam Walton, Byron Bradford, Randy Rothrock, Ron Gardner and Mark Avery. In the middle row are the cheerleaders on one or both of those teams, from left: Billiejean Arthur Clark, Phyllis Green Turner and Joella Strader Glenn. Back row: Jim Monahan, Mike Blaase, Terry Miller, Bill Blackwell, Terry Knaus, Bill Anderson, Doug Dunagan, Jerry Glenn and Reggie Finn. Reprinted from the Arcola Record-Herald, January 30, 2014.